Egypt’s President Abdel-Fattah El-Sisi discussed on Sunday with Field Marshal Khalifa Hafter, commander of the Libyan Armed Forces, the latest developments in Libya and Egypt's keenness to see unity, stability and security in its neighbouring country, presidential spokesperson Bassam Rady said. During the meeting, El-Sisi affirmed Egypt's support for the efforts to combat terrorism and extremist groups and militias in order to achieve security and stability for the Libyan citizen in all the country’s territory to establish the foundations of a stable and sovereign civil state. Libya has been a war-torn country since the death of its leader Muammar Gaddafi in October 2011. Islamist militants have since controlled large parts of the vast country, including the capital Tripoli. 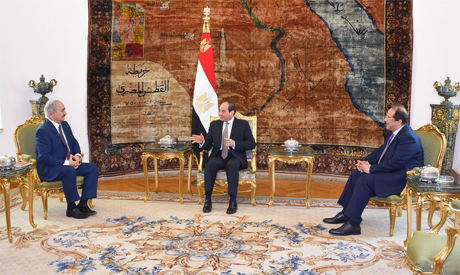 El-Sisi has pledged to support Egypt's neighbouring countries through cooperation and coordination.